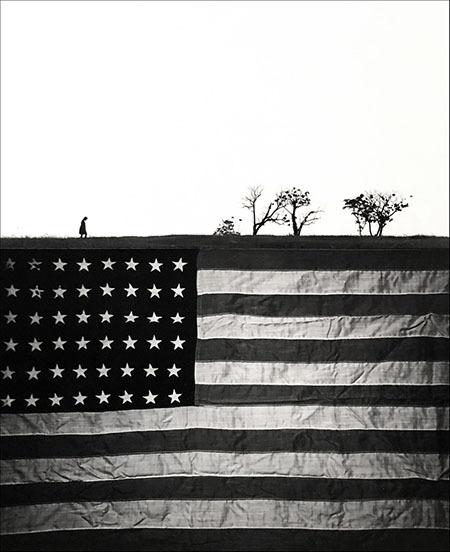 Paige Pinnell, "America, America, Series #4," 1965, gelatin silver print, 9 3/4 x 7 3/4"
The late Paige Pinnell, who passed away in 2017, was a multi-faceted proponent of photography. As a photography dealer, educator and collector, Pinnell was also a photographer himself. “The Artist as Collector” includes selections from Pinnell’s collection, featuring Paul Caponigro, Todd Webb, Jerry Uelsmann, Eadward Muybridge and Edward Curtis among others. With such a broad range of photographers spanning the late 19th- to the mid-20th-century, the collection could well lack a clear vision. But, thanks to Pinnell’s taste and eye, we get a fascinating and engaging photographic view of Americana, if what you would expect from this group. The portraits of indigenous Americans captured by Edward Curtis are noble and powerful. Paul Caponigro’s landscapes are serene and beautiful. Todd Walker’s nudes add a contrast of color to the mostly black and white images in the collection. But Pinnell’s own photographs turn out to be the stunners of the collection. Mostly in black and white, and mostly taken around the mid-1960s, Pinnell captures a mid-century America with fantastic composition and an eerie feeling that inhabits the images. A native of Macon, Georgia, Pinnell attended high school and college in Florida, where most of the photographs were taken. His camera inhabits abandoned spaces, shadowy figures, and ominously dark landscapes. It’s a compelling and mysterious portrait of Florida.